Roseanna Burrell passed away peacefully in her 91st year surrounded by her loving family at Royal Inland Hospital on Boxing Day. Roseanna was born near Kenora Ontario on February 24, 1927. 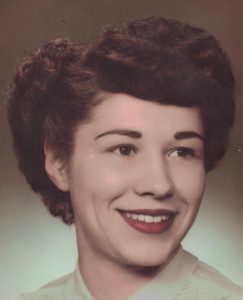 She is survived by her loving husband of 58 years Glen Burrell and her daughters Brenda Christian (Ken) and Kathy Elliott (David). She had five grandchildren that she adored and shared life’s lessons with, Nicholas (Melissa), Vanessa, Justine (Blair), Jonathan and Taryn. She was blessed this summer to have a great grandson, Rowen Reid Smith. Roseanna is also survived by her sister Stella Hill in Ontario and her brother Bill Murray on Vancouver Island. Grandma was a remarkable woman from humble beginnings that was the foundation of her family and a true friend to many. 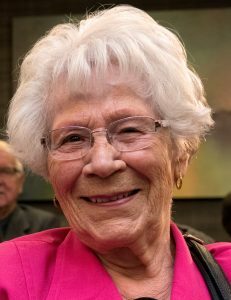 She walked every day in West Highlands Park, baked and cooked for family and friends and enjoyed every minute with her grandchildren and her regular outings with her closest friends. In keeping with her wishes, there will not be a service and the family asks that in lieu of flowers you make a donation to your charity of choice and take a memorial walk on a trail or in a place that is full of nature’s gifts to us. Thoughts and Prayers to the Family. Hugs too You All, She will be Missed. From Ernest Junior Murray and Tammy Davis.. RIP Auntie Roseanna. My deepest condolences to the family. Glen I remember the days when your wife always made that special toffee candy for the girls at Weyerhaeuser days. I am glad I saw you at Costco Christmas Breakfast. With deepest sympathy. Brenda, I am so sorry to hear of your Mom’s passing. My deepest condolences. May sweet, joyful memories carry you through these difficult times….BIG HUGS! Glen, Brenda, and family. My sincere condolences. Glen, you and Roseanna always brightened my day wherever I saw you. I always enjoyed your visits. Roseanna was a very special lady. I am very sorry to hear of Roseanna’s passing. I enjoyed our little chats at the front counter at TCC. My deepest sympathy. Glen. We are sorry to hear of the loss of Roseanna. We extend our deepest sympathy. I am so very sorry to hear of Roseanna’s passing. She was such a wonderful lady, always with a smile and a kind word. I always loved to visit with the both of you and am so sorry I didn’t do it more often. Let this be a lesson to all of us to spend more time with those we care about, don’t put it off. Roseanna with her smile, her gentleness and her good humour will be sadly missed by all those who knew her. Thinking of you and your family at this time Brenda. Sending you a big hug. Brenda & family, we are sorry to hear of your mom’s passing. Our sincere condolences. Our deepest sympathies to you with the loss of your dear Mom. She was so blessed with your love and support and the comfort of having you all there when she passed. In friendship, Tam & Ray. We are so sorry for your loss. She was a wonderful lady and will be missed by all. We were very sorry to hear that your mom had passed away. She was a very lovely lady. We would like to express our deepest sympathy to your whole family. My deepest condolences,she always had a light in her eye when visiting with her. May it give you comfort to know she is shining her light down on you all. We are so sorry to hear about Roseanna’s passing. She was a lovely, kind woman and a talented wood-carver. Her beautiful cherry wood shoe horn still hangs in our foyer. Our deepest sympathy to you, Glen and to your family.